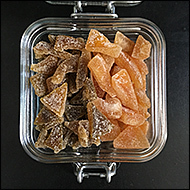 Two flavors of our candied citrus peel presented in a lovely Italian glass clamp lid jar. 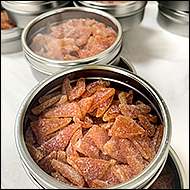 Reviving the traditional art of fruit confectionary and utilizing the entire fruit, we candy citrus peel to create a tasty, bite size, fruit candy. These candies can also be chopped and added to cookie, cake, scone or muffin dough or swirled into ice cream and yoghurt. They are a luscious topping for oatmeal, granola or rice pudding and can offer a zesty accent to vinaigrettes or tagines. In the old days this type of confectionary was well known as Rowntrees Fruit Pastilles, a kind of jelly candy originating in Tyneside, England in 1881. 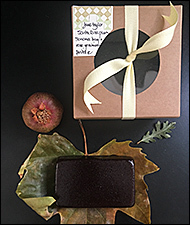 We are making these pastilles in soft, sliceable rectangles to enjoy with tea, cheeses and charcuterie. They store best in a cool and dry place. 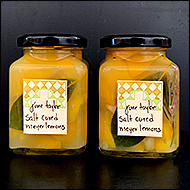 When you are looking for a burst of salt spiked zesty citrus to enhance your fish dishes, salads, salsas, tagines or cocktails these citrus fruits are an essential ingredient in your pantry. 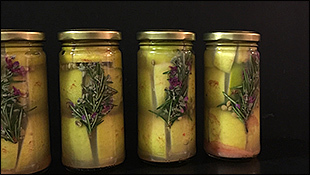 Preserved with pink Himalayan salt and aromatics herbs from my kitchen garden. 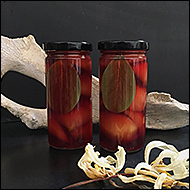 We gently poach Seckel pears in a warmly spiced syrup to accentuate the pears sweet and spicy flavor, and then top it off with a blackcurrant vinegar. The pears absorb the rich flavors and become a wonderful partner to blue cheeses and winter meats. But with a dollop of cream, they are a simple dessert delight. This non dairy fruit cheese is a historically British way to preserve fruit. 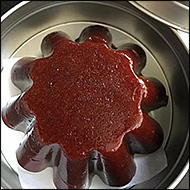 It is a deeply concentrated and sliceable fruit paste, traditionally accompanied by cheese. A wonderful combination with Andante Dairy "Cadence" cheese (cow's milk and cream) or "Crotin" (goat's milk). Or serve simply with tea, especially green teas. Fruit cheese should not be refrigerated. Please store in a cool, dry place. Gravenstein apples have long been associated with Sonoma County in California, although current production has declined so severely in recent decades that Slow Food USA declared the apple a heritage food in 2005 and included it in their ark of taste. One of the first apples to ripen each year, the Gravenstein is sweet and tart, and when cooked into a sauce is delicately sweet, yet crisp and clear in its floral apple flavor. It is excellent with pork sausage and other roasted meats. Serve with potato pancakes or in yogurt, with fresh cheese, or alongside breakfast foods. This is a fresh product with almost no added sugar. We recommend eating within two weeks of opening. 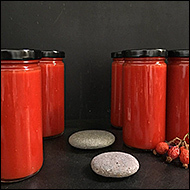 An old fashioned style favorite made with organic dry farmed tomatoes. Intensely sweet, yet spicy and zesty, this ketchup adds rich flavor to hamburgers and fries, or makes a special grilled cheese sandwich when paired with a flavorful cheddar cheese. 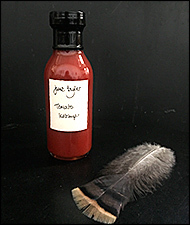 The essence of organic, dry-farmed Early Girl tomatoes cooked into a delicately sweet paste and versatile sauce. 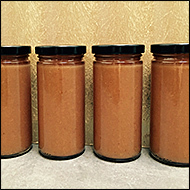 Elegant and simple, and a wonderful addition to ragu sauces, bean dishes, or as a coating on pasta with basil and parmesan. 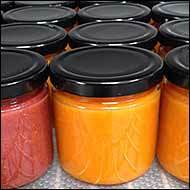 With only a pinch of salt and sugar added, please refrigerate after opening. 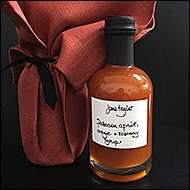 We are thrilled to offer our new linen napkin as a gift wrap for our preserves, syrups, candies and specialties. The napkins are a generous 18 inch square and made of a beautiful thick linen by our friends at Studiopatró. 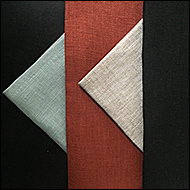 The wraps are available in four colors - cinnamon, ocean, oatmeal and black. We will creatively wrap your gift of choice and tie it with a simple cotton herringbone ribbon. After the contents have long been eaten you will have a fine linen napkin to use over and over again and enjoy.